Those who are wondering what kind of quality Dr. Dixon's Red Plan will bring to Duluth's schools might be interested in Faribault School's recent review and comment submitted to the Minnesota Dept. of Education. A leader of Krause Anderson Construction which is in charge of a fair amount of the Red Plan and sent in a nice letter-to-the-editor last year lauding the Red Plan. It is also fixing up some of Dr. Dixon's 1997 Faribault school buildings. 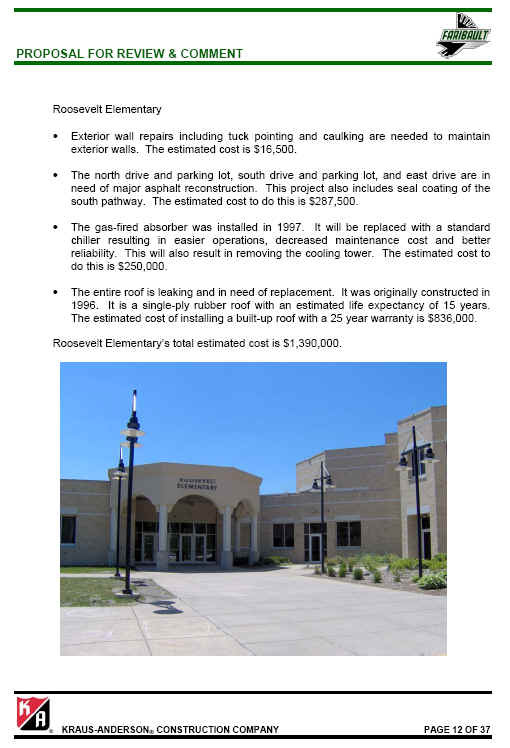 It seems that twelve years after its construction, Faribault's Roosevelt Elementary School is suffering from a roof failure. That's three years shy of its expected 15-year lifetime. One of the requests for bids on a Red Plan roof listed roof specifications that guaranteed that the Garland Company would supply the roof. It prevented any bidding on supplies. Garland has a reputation for materials that are typically 30% more expensive than its competitors roofs but no better in quality. JCI submitted the specs and recommends the winning bids to the School Board. When another roofing manufacturer complained about this the District backed off its non competitive bids. By the way, the Red Plan sets no money aside for maintenance. If this is indicative of the future Duluth can be expecting to pay for repairs to the Red Plan long before its bonds are paid off.